Are you looking for one of Dunsborough's finest luxury holiday houses in which to enjoy your next break away? Then this home may be what you're looking for! The Sanctuary is a modern, stylishly designed home, built and decorated with a minimalist feel, that truly is defined by it's name. No bunk beds here! - This house is for those truly looking for a luxury alternative. 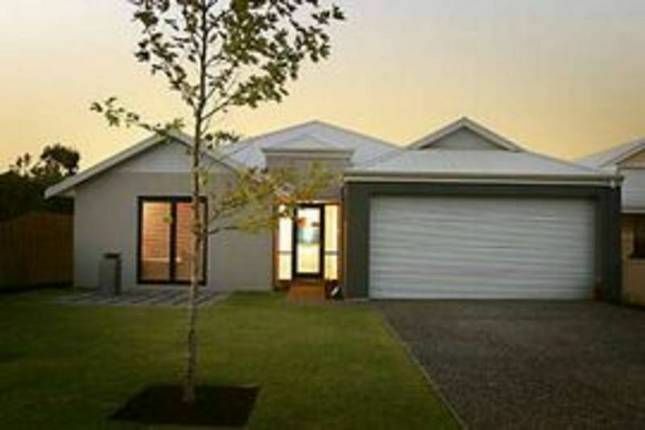 This 4 bed, 2 bath home is very spacious, maximised by high vaulted ceilings and complimented by Tasmanian Oak floors in the hallways, kitchen, dining and living areas. The kitchen is galley styled, complete with stainless steel fittings and appliances ready to dine and entertain with style. There is a media/theatre room separate from the living area for more intimate TV or movie viewing. The house includes a 80cm Stereo flat screen wall mounted TV, DVD player and 2 audio systems - 1 with CD and another that is an rechargeable, portable IPod dock. The Sanctuary has been tastefully decorated to a luxury standard with new, contemporary furniture such as leather sofas and dining chairs, halogen downlights on dimmers and quality window treatments that, as a whole, give this home a sleek, modern feel. Bedrooms contain modern furniture and high quality mattresses and bedding. Bedroom 1 (Master) has a QS bed, Bedroom 2 has 2 king single beds (which when pushed together form a king size bed), Bedroom 3 has a double bed and Bedroom 4 has a QS bed. Linen, comprising of fitted sheets, top sheets, pillowslips, bath towels, face washers, bath mats, hand towels & tea towels IS included. Bathroom 1 is an ensuite off the master containing a shower and bathroom 2 contains a shower and a bath. Both bathrooms are heated to take the chill off on the colder days. Views to the leafy green garden and creek/nature reserve beyond are to be had from the banks of windows in the dining and living areas. The open plan living area extends out the door to a covered Alfresco area containing a stylish 8-seater dining setting and a hooded gas BBQ. There is also an outside hot and cold shower to wash off from the beach. Sorry, but we have a strict NO PETS policy. Complimentary tea or coffee is available for a refreshment upon arrival and later, enjoy with our compliments, a bottle of chilled local Margaret River wine !! We have recently introduced a coffee pod machine with enough pods for all guests to enjoy a coffee each. Please refer to calender below for VACANCIES and PRICES. Dunsborough is at the doorstep of the Margaret River Wine region and is sheltered by the waters of Geographe Bay. It represents an ideal holiday location with it's quiet coves, sandy beaches (both quiet child safe beaches and surf beaches), surrounding national park, nature reserves and numerous scenic walk trails. Nearby Meelup, Eagle Bay and Bunker Bay offer perfect beaches for fishing, swimming and snorkeling. The area is also well known for whale watching (September to December), golfing, and caves. Many of the Margaret River Wine Region's fine wineries are situated only a few minutes drive from the town centre, not to mention the numerous galleries displaying the works of local artisans close by. The Sanctuary is located just under 1 km from the Dunsborough town centre. From Perth, the house is 258km south (3 hours drive) travelling down the Mitchell Fwy, then down South West Hwy (Route 1) and the Bussell Hwy (Route 10). Local Attractions, apart from the many glorious swimming and surfing beaches along the Cape Naturaliste coast, include numerous award winning wineries, art/craft galleries, several breweries as well as the Margaret River Chocolate Factory, Fonti Farm cheeses & yoghurts (home of the best milkshakes in the SouthWest), Simmos Icecreamery & Country Life Farm. Many recreational sports are available from Dunsborough including Scuba Diving (The HMAS Swan wreck & The Busselton Jetty are particularly popular! ), Surf Cat hire, Surfing School, golfing (2 courses available in close proximity), fishing charters, archery, caving, horse riding and whale watching (seasonal), to name a few. In all, something for all ages! tub, shower, Toilet is separate next to bathroom. We loved staying in this home. The location with regards to the beach and other places around Cottesloe was great. It was equipped with everything we needed. We enjoyed our stay very much! This a terrific property, very luxurious and well maintained. Location is a 5 minute drive from Dunsborough town centre and also a 5 minute walk to a nearby beach (not great for swimming but beautiful to walk along). We had a wonderful stay and would definitely come back here. Really relaxing and enjoyable stay. Loved a lot about this property. Very clean, had everything you needed in the kitchen. A bit of a walk into town, but you're on holidays so it doesn't really matter at all. The separate TV room was very useful is adding to the sense of space! The travel cot and highchair were extremely helpful. Overall, a very well-equipped and spacious house and the manager was very friendly and accommodating. Only gripe is that the shower curtain leaked a little and caused puddles on the floor. We had a fantastic time staying at the Sanctuary everythig we could ask for. The location was ideal for everything we wanted to do and see. THANK YOU. Wonderful property ,very close into town . We all felt at home straight away as once again had space to move around. The Sanctuary Luxury Holiday Home truly met our expectation. The house is spacious and modern. It has everything one needs, the kitchen was fully equipped, it had board games and was nicely and comfortably furnished. The garden is quiet and the kids had fun playing with the friendly neighbour kids. The home is a short 2-min drive from the little town area of Dunsborough where one can get everything needed. We enjoyed our stay very much and we would choose this accommodation again.